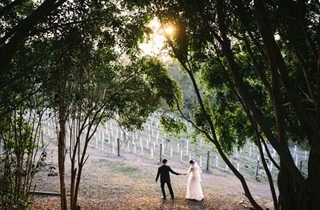 Create a lifetime of memories with an intimate and bespoke wedding at Clear Mountain Lodge, Spa and Vineyard north of Brisbane. The rugged natural beauty of the Glasshouse Mountains and the sunsets that silhouette them provide the perfect backdrop for family and friends to celebrate and enjoy time together. Cresting the peak of Clear Mountain, this amazing 53 room boutique retreat commands the scenery around it, offering panoramic views north to the blue streak of Moreton Bay and the granite spires of the Glasshouse Mountains, back to the distant silver glimmer and hazy glow of the towers of Brisbane’s CBD. Clear Mountain Lodge, Spa and Vineyard is becoming renowned among Brisbane brides for combining modern sophistication with a natural and rugged charm to provide a unique wedding, and a day that the happy couple can cherish forever. A unique wilderness experience, just 40 minutes from Brisbane’s CBD, this superbly secluded retreat showcases the best Clear Mountain has to offer - warm hospitality, sumptuous cuisine and wine, breathtaking scenery and magnificent bushland surrounds. 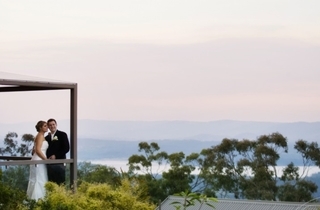 The extensive gardens, breathtaking views and unbelievable proximity to Brisbane, make the Lodge an idyllic setting in which to exchange vows. Embrace the beauty of nature and wed in a simple garden ceremony in the Lodge’s intimate manicured ceremonial gardens overlooking the spectacular beauty of the D’Aguilar Ranges. Live the high life with family and friends and celebrate against a truly beautiful and quintessentially Australian backdrop. The Clear Mountain Lodge wedding philosophy is that the experience of planning the special day should be as rewarding and enjoyable as the day itself. Stephanie’s Mountain Spa, is perched above the Lodge, Stephanie's will offer a variety of pre-nuptial packages for busy brides and bridesmaids. Celebrate your wedding in style with Stephanie's Mountain Spa, enjoy an on the Mountain Bridal Shower or Spa Party in anticipation of your big day. Stephanie’s Spa is fully equipped for bridal parties, both large and small. Look forward to enjoy champagne and canapés overlooking the Samsonvale Dam before indulging in luxurious spa treatments designed to care for your skin and restore balance, inside and out. Stage your perfect day with the assistance of the Lodge’s on-site event coordinators, world-class Executive Chef and food and beverage team, able to assist with every detail of the planning and execution. 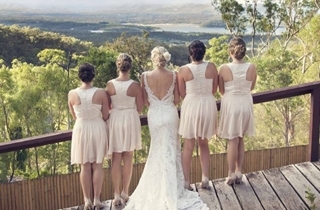 From simply elegant to luxuriously unforgettable, Clear Mountain Lodge is the ideal Brisbane wedding venue for your wedding in Brisbane. We invite you to share one of your most precious days with us, your wedding day. Clear Mountain Lodge is that special hidden gem a unique location that has everything. Clear Mountain Lodge’s ceremony garden offers you a serene and natural setting perfect for exchanging those sacred “I Do’s”. With its breath-taking vistas paired with the beautiful sounds of the harp or string quartet guiding you down the aisle we will create for you the perfect wedding ceremony, one that you and your closest friends and family will not soon forget. Following an intimate wedding ceremony your guests will relax with pre-dinner drinks and canapés in the Clear Mountain lookout lounge which boasts unrivalled panoramic views of the Glasshouse Mountains, Redcliffe Peninsular, Moreton Bay all the way around to Brisbane city. Clear Mountain Lodge provides you with a dream location for your wedding photography. Take advantage of the unlimited photo opportunities in and around Clear Mountain using the natural backdrop to capture images to last a lifetime. Guests will be escorted via a candle lit pathway through the Clear Mountain Serenity gardens into the beautifully styled Serenity function room perfectly decorated to suit your individual personality and style. Choose from a carefully prepared function menu designed by our dedicated team of passionate chefs using fresh seasonal produce grown right here on site in our Clear Mountain chef’s market gardens. Canapes and 3 course menu. Additional beverage packages available. Pricing based on min of 50 Adults but happy to customise for fewer guest numbers. The exclusive use of Clear Mountain Lodge’s Ceremony Garden and Pavilion which overlook the D’Aguilar Mountain Ranges, timber bench seating, red carpet, wedding registration table which is perfectly clothed and skirted in white. you to help you make the perfect choice that is just right for your special day. Pricing starts at $107 per person. Exclusive use of the Clear Mountain Ceremony Garden and Pavilion which overlook the D’Aguilar Mountain Ranges, timber bench seating, red carpet, wedding registration table which is perfectly clothed and skirted in white. Ceremony Gardens set with White Umbrella, Wooden bench seating, red carpet and skirted and clothed registration table. Serenity Room set with Dry Bars stylishly covered in White or Black Lycra covers, and decorated with tea light candles. An initial block of 10 Superior Rooms held deposit free along with a special discounted rate for your guests to book not available publically.